"We thought that planets cannot really excite their stars, but we find that this one does," says Julien de Wit, a postdoc in MIT's Department of Earth, Atmospheric and Planetary Sciences. "There is a physical link between the two, but at this stage, we actually can't explain it. So these are mysterious pulsations induced by the star's companion." For the first time, astronomers from MIT and elsewhere have observed a star pulsing in response to its orbiting planet. The star, which goes by the name HAT-P-2, is about 400 light years from Earth and is circled by a gas giant measuring eight times the mass of Jupiter—one of the most massive exoplanets known today. The planet, named HAT-P-2b, tracks its star in a highly eccentric orbit, flying extremely close to and around the star, then hurtling far out before eventually circling back around. The researchers analyzed more than 350 hours of observations of HAT-P-2 taken by NASA's Spitzer Space Telescope, and found that the star's brightness appears to oscillate ever so slightly every 87 minutes. In particular, the star seems to vibrate at exact harmonics, or multiples of the planet's orbital frequency—the rate at which the planet circles its star. The precisely timed pulsations have lead the researchers to believe that, contrary to most theoretical model-based predictions of exoplanetary behavior, HAT-P-2b may be massive enough to periodically distort its star, making the star's molten surface flare, or pulse, in response. The team came upon the stellar pulsations by chance. Originally, the researchers sought to generate a precise map of an exoplanet's temperature distribution as it orbits its star. Such a map would help scientists track how energy is circulated through a planet's atmosphere, which can give clues to an atmosphere's wind patterns and composition. In the image at the top of the page the Hubble Space Telescope has observed the variable star RS Puppis over a period of five weeks, showing the star growing brighter and dimmer. 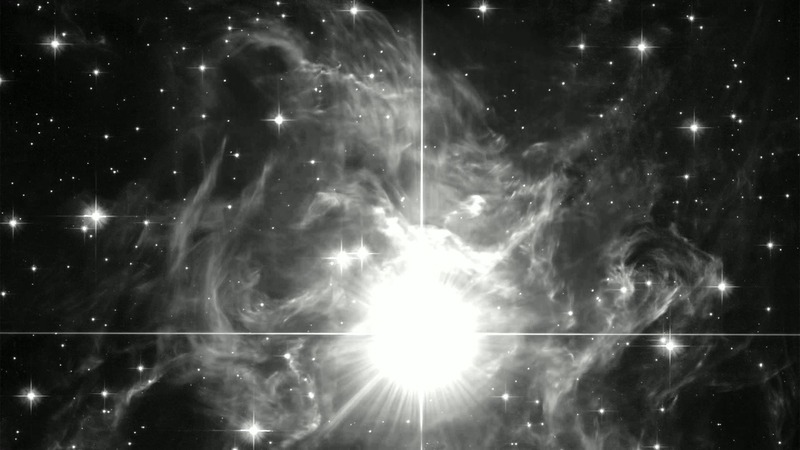 These pulsations have created a stunning example of a phenomenon known as a light echo, where light appears to reverberate through the murky environment around the star. With this goal in mind, the team viewed HAT-P-2 as an ideal system: Because the planet has an eccentric orbit, it seesaws between temperature extremes, turning cold as it moves far away from its star, then rapidly heating as it swings extremely close. "The star dumps an enormous amount of energy onto the planet's atmosphere, and our original goal was to see how the planet's atmosphere redistributes this energy," de Wit says. The researchers obtained 350 hours of observations of HAT-P-2, taken intermittently by Spitzer's infrared telescope between July 2011 and November 2015. The dataset represents one of the largest ever taken by Spitzer, giving de Wit and his colleagues plenty of observations to allow for detecting the incredibly tiny signals required to map an exoplanet's temperature distribution. The team processed the data and focused on the window in which the planet made its closest approach, passing first in front of and then behind the star. During these periods, the researchers measured the star's brightness to determine the amount of energy, in the form of heat, transferred to the planet. Each time the planet passed behind the star, the researchers saw something unexpected: Instead of a flat line, representing a momentary drop as the planet is masked by its star, they observed tiny spikes—oscillations in the star's light, with a period of about 90 minutes, that happened to be exact multiples of the planet's orbital frequency. "They were very tiny signals," de Wit says. "It was like picking up the buzzing of a mosquito passing by a jet engine, both miles away." Stellar pulsations can occur constantly as a star's surface naturally boils and turns over. But the tiny pulsations detected by de Wit and his colleagues seem to be in concert with the planet's orbit. The signals, they concluded, must not be due to anything in the star itself, but to either the circling planet or an effect in Spitzer's instruments. The researchers ruled out the latter after modeling all the possible instrumental effects, such as vibration, that could have affected the measurements, and finding that none of the effects could have produced the pulsations they observed. "We think these pulsations must be induced by the planet, which is surprising," de Wit says. "We've seen this in systems with two rotating stars that are supermassive, where one can really distort the other, release the distortion, and the other one vibrates. But we did not expect this to happen with a planet—even one as massive as this." "This is really exciting because, if our interpretations are correct, it tells us that planets can have a significant impact on physical phenomena operating in their host-stars," says co-author Victoria Antoci, a postdoc at Aarhus University in Denmark. "In other words, the star 'knows' about its planet and reacts to its presence." The team has some theories as to how the planet might be causing its star to pulse. For example, perhaps the planet's transient gravitational pull is disturbing the star just enough to tip it toward a self-pulsating phase. There are stars that naturally pulse, and perhaps HAT-P-2b is pushing its star toward that state, the way adding salt to a simmering pot of water can trigger it to boil over. De Wit says this is just one of several possibilities, but getting to the root of the stellar pulsations will require much more work. "It's a mystery, but it's great, because it demonstrates our understanding of how a planet affects its star is not complete," de Wit says. "So we'll have to move forward and figure out what's going on there. But it's great, because it demonstrates our understanding of how a planet affects its star is not complete." NASA: "Wacky World of Exoplanets Continues to Surprise Astronomers"
Friday's 'Galaxy' Insight –"Why the Universe Exists"